Young people from Sussex and Surrey assembled at St Catherine’s School, Bramley, for theDistrict Final of the Rotary Young Musician competition on 21 February. The event took place in a purpose-designed concert hall with state of the art acoustics and facilities – a magnificent venue for some magnificent performances. The young people, all under 18 years of age and not full time music students, were judged by three adjudicators, Elizabeth Harley, Gillian Ramsden and Peter Allwood. There were four vocalists and ten instrumentalists with instruments as diverse as saxophone, violin, oboe and harp. Each had to play or sing two pieces in contrasting style with a total time of 10 minutes. The event started at 2 pm and the audience was spellbound for three hours listening to the outpouring of talent from such young people. Alas it came to an end at about 5 pm, after which the adjudicators retired to deliberate and decide on the winners and runners up. Meanwhile, light refreshments were provided by members of Godalming Rotary Club. The adjudicators commented on the entrants’ performances before announcing the results. In the vocalist section the winner was Olivia Middleton (entered by the Rotary Club of Horsham) and the runner up was Emma Hibbit (RC Epsom). The instrumental section was won by Heather Brooks on her harp (RC Titsey and District) and runner up James Drew playing a cello (RC Bognor Hotham). All four received their prizes from District Governor Doug Price and they will now proceed to the Regional Final on 26th April at St Joseph’s College, Reading. 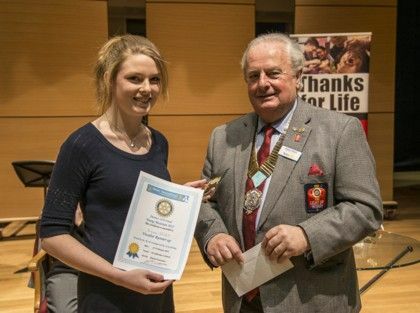 The event was organised and hosted by the Rotary Clubs of Cranleigh and Godalming, under the direction of Cranleigh Rotarian Norman Every, who also acted as compere on the day.